There is some inspirational news to share as we close out 2014. During Thanksgiving week, I wrote about Lauren Hill and Natalia Marsh-Welton, two heroes who battled brain cancer this year. These two young people made a huge impact fighting hunger and cancer. Here is the latest. Yesterday, Lauren Hill's fundraising efforts for brain cancer research achieved a major milestone: one million dollars raised! Most of these funds were collected just within the last two months, since she introduced the Layup for Lauren Challenge. It's not over yet too. As we speak donations are still being collected by The Cure Starts Now. This is a charity dedicated to researching rare brain tumors. Lauren, a basketball player for Mount St. Joseph University, played in several games this season. She scored baskets in each game she played, despite the cancer. But Lauren's biggest assist this year has been in the area of brain cancer research. She recognized that rare diseases do not get the funding for research. She has repeated that message at every opportunity and created a fundraising initiative that is jump-starting cancer research. Lauren's rare type of brain tumor can only be cured if there is enough resources put into the effort. In fact, the cure for all cancers may be found within this research. People have responded to her message. Donations have poured in. Research can accelerate now because of this money. Since her story has spread fundraising opportunities will continue. As the basketball season unfolds more teams, for example, can do the Layup for Lauren Challenge. The public display of support may yet get others involved. Hopefully the United States Congress will add funding to the cause through their Rare Disease Caucus. Out in Phoenix, Arizona something else magical happened this week. Homeless and at-risk children at the Central Arizona Shelter Services received a special holiday package. It had ingredients for soup and 100 blankets for the children to keep warm this winter. This was all because of 11-year old Natalia Marsh-Welton, whose dying wish was to feed the hungry and homeless. The soup was Natalia's own recipe. Natalia, afflicted with a brain tumor, used her own birthday celebration in October to hand out soup and blankets at the Drop Inn Center for the homeless in Cincinnati. Natalia passed away in November from the cancer. But her spirit keeps giving. The Make a Wish Foundation sent the package to the shelter in Arizona. It had Natalia's special recipe with the ingredients, so the children were able to make the soup. Beyond the contents of the package, the children are thankful to know they are not forgotten. They need to know that people do care about the hungry and homeless. There are over 49 million people in America who live in hunger, and around 16 million of these are children. They don't know where their next meal is coming from. Some are homeless and have no shelter from the harsh cold of winter. Natalia's plan was to feed everyone and keep them warm. It's great to see Natalia's soup and care spreading to other cities. 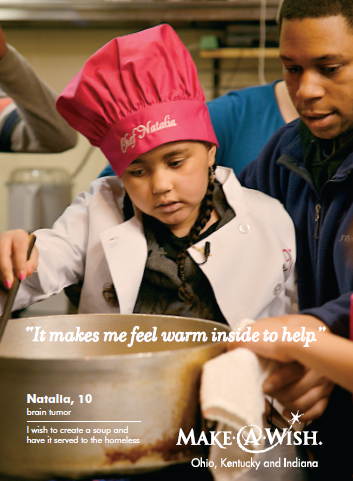 A shelter in Louisville, Kentucky has also distributed Natalia's soup. Natalia's family has created a fundraiser to pay her final expenses and to continue her legacy.